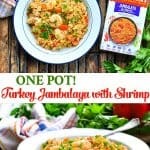 This One Pot Turkey Jambalaya with Shrimp is an easy and wholesome dinner recipe that cooks in a single dish with just 5 minutes of prep! This post is sponsored by Zatarain’s. All thoughts and opinions are my own. The ultimate quick-prep meal to use up your holiday leftovers! 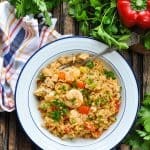 Loaded with meat, seafood, fresh vegetables and zesty seasonings, this One Pot Turkey Jambalaya with Shrimp is an easy and wholesome dinner recipe that cooks in a single dish with just 5 minutes of prep! Hey, friends! Are you gearing up for Thanksgiving in a few days? We’re hosting family at our house this year, so I’ve already been busy coordinating table settings, planning a menu, and ordering our turkey! I’m happy to invest hours in a big holiday meal — preparing all of the sides, baking a special dessert, and making sure that the table is set. But when the feast is over? I want nothing to do with cooking — or washing dishes. I’m done! 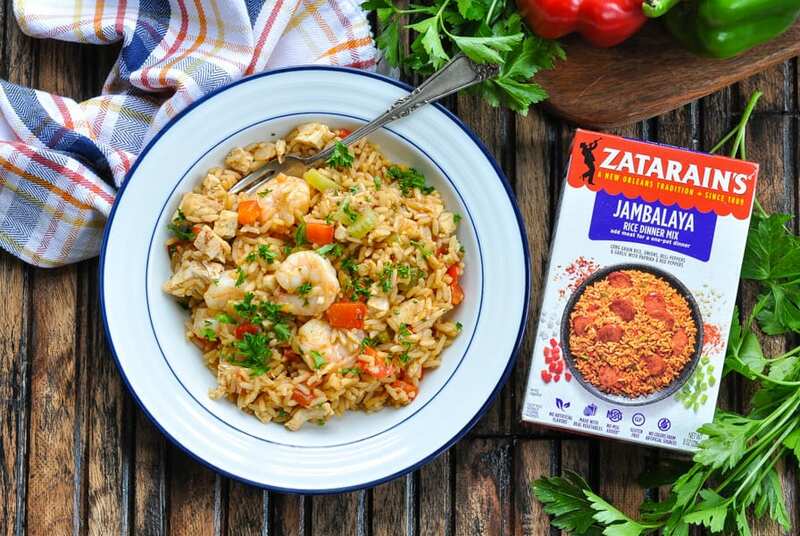 This year, I’ll take advantage of leftover turkey and a box of Zatarain’s Jambalaya Rice Mix to create this wholesome shrimp jambalaya in the days after our feast. It’s a quick solution to get a tasty dinner on the table — especially when I don’t want to spend much time in the kitchen. Make it your own by adding extra protein and veggies; or keep it as easy as possible and simply open the package and add your turkey! Gumbo is a traditional stew popular in Louisiana. It’s typically made with a roux-based stock, meat or shellfish, a thickener, and what Louisianians call the “Holy Trinity” of vegetables (celery, bell peppers, and onions). 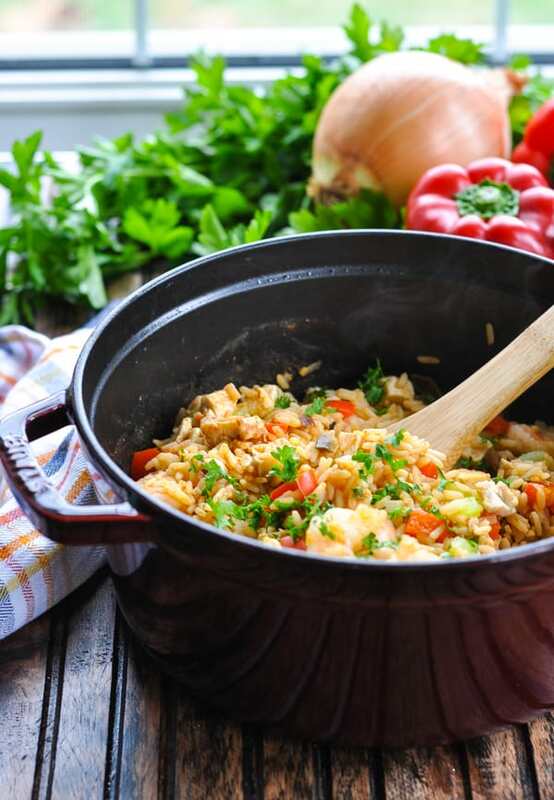 Jambalaya, a similar dish that also originated in Louisiana, is a combination of meat, vegetables and rice. The meat almost always includes smoked sausage, along with chicken or shrimp. Gumbo is more like a soup, which is served over a small amount of rice that has been cooked in a separate pan. 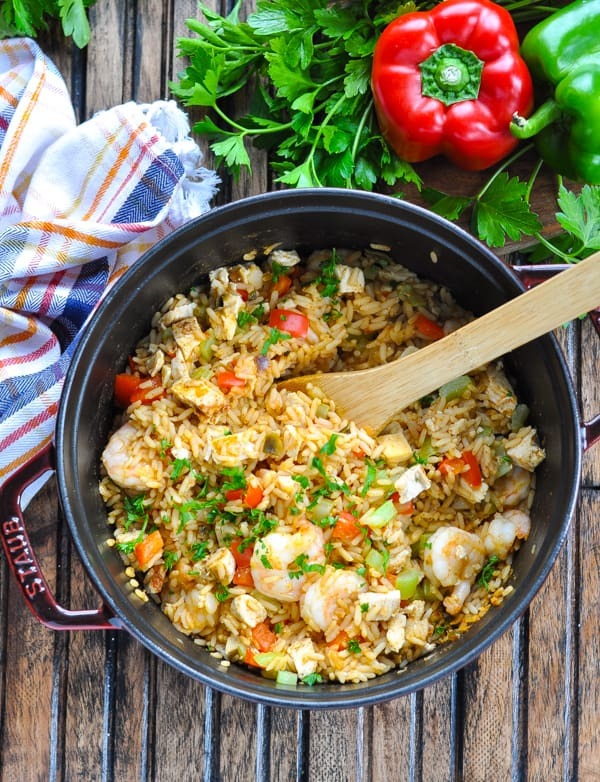 Jambalaya is thicker rice-based meal, and the rice is cooked in the same pot as the meat and vegetables. 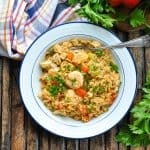 Today I’m excited to share my shortcut version of a Turkey and Shrimp Jambalaya without sausage! It’s loaded with delicious, satisfying turkey, so you don’t even need the extra meat. If you’d like to try a gumbo recipe instead, though, you can use up your Thanksgiving leftovers in Zatarain’s Holiday Turkey Gumbo. You can’t go wrong with either option! Let’s start with the ingredients! 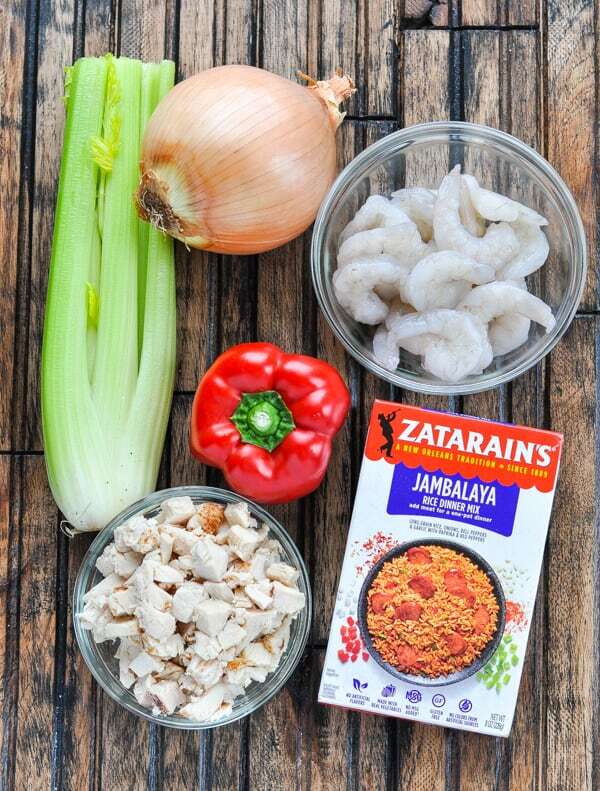 You’ll need a box of Zatarain’s Jambalaya Rice Mix, cooked turkey, raw shrimp, celery, bell pepper and onion. 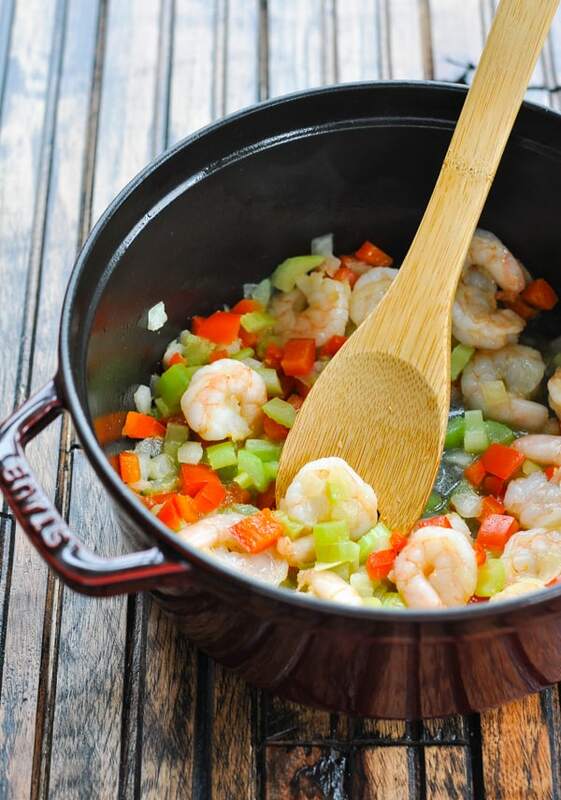 First, cook the shrimp and vegetables in a Dutch oven or large saucepan just until the shrimp turn pink. How long does it take to cook raw shrimp in jambalaya? The raw shrimp only require about 5 minutes of cooking before they start to turn pink. As soon as they’re pink, use a slotted spoon to remove the vegetables and shrimp from the skillet and set aside. They will go back into the pot during the final 5 minutes of cooking time, so you don’t want to overcook the shrimp and make them tough or chewy. and the box of Jambalaya Rice Mix. 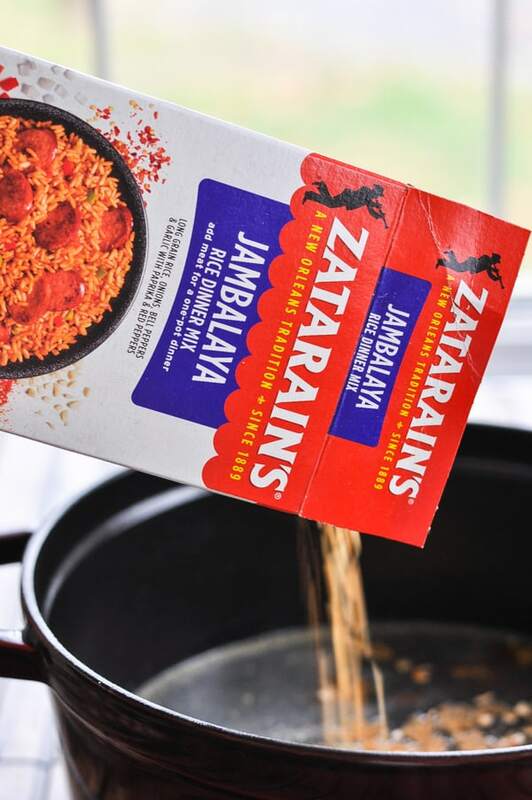 The Zatarain’s mix is so convenient because it contains all of the classic spices and seasonings that give jambalaya it’s delicious, zesty taste. You don’t have to worry about measuring or shopping for special ingredients — it’s all included in the box! The rice mix simmers, covered, for about 25 minutes. During the final 5 minutes, add the turkey, cooked shrimp and vegetables to the pot to heat through. After the dish rests for 5 minutes, give it all a fluff with a fork and your meal is ready! How easy is that?! 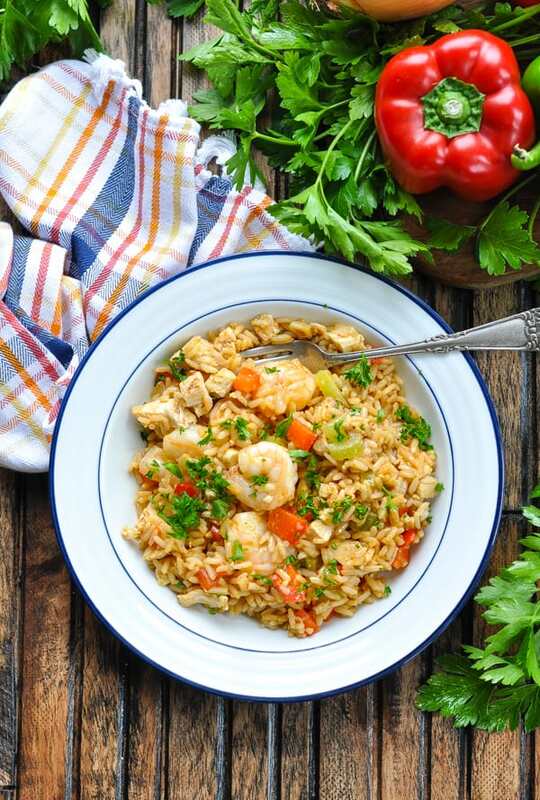 Can you freeze Turkey Jambalaya with Shrimp? This dinner is best enjoyed immediately after it’s prepared. I don’t recommend freezing jambalaya with shrimp, since the rice may be slightly mushy and the texture of the shrimp will be poor. 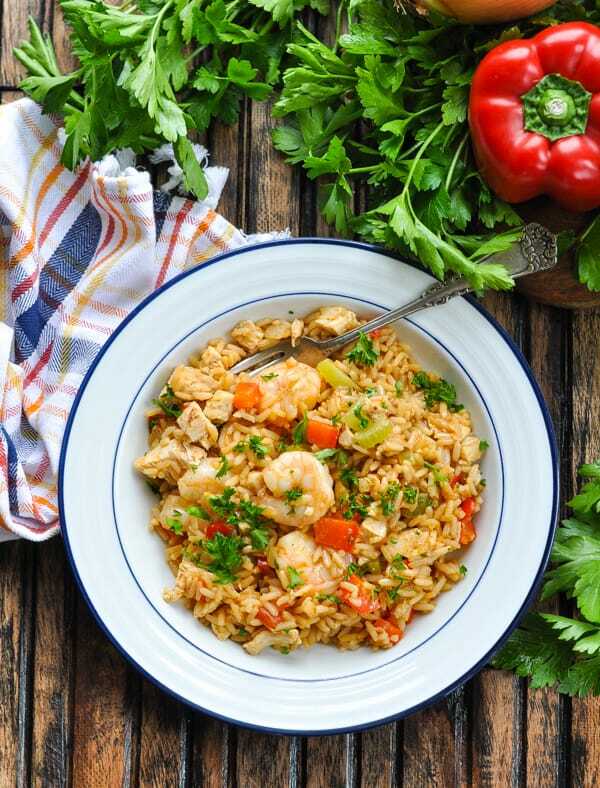 What goes with Turkey and Shrimp Jambalaya? Remove the shrimp and vegetables from the pot as soon as the shrimp starts to turn pink. 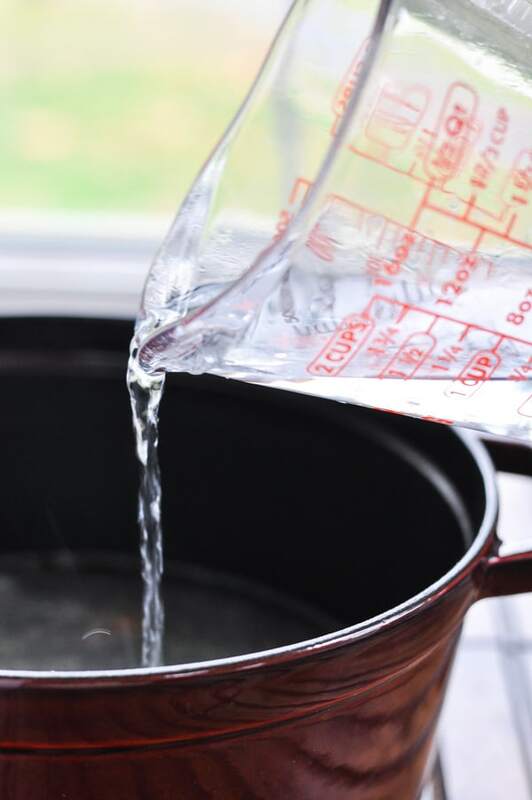 The shrimp will be added back to the pot for the final 5 minutes of cooking time, so you want to make sure that you don’t overcook the shellfish and end up with a rubbery finished product. If you don’t have any leftover holiday turkey, you can substitute with an equal amount of cooked, diced chicken. Instead of shrimp, you can add 1/2 lb. of smoked sausage to the turkey jambalaya. Brown the sausage in the pot with the vegetables in the same manner described for the shrimp. Garnish with fresh parsley, if possible. It adds a nice, bright flavor (and color) to the finished dish. 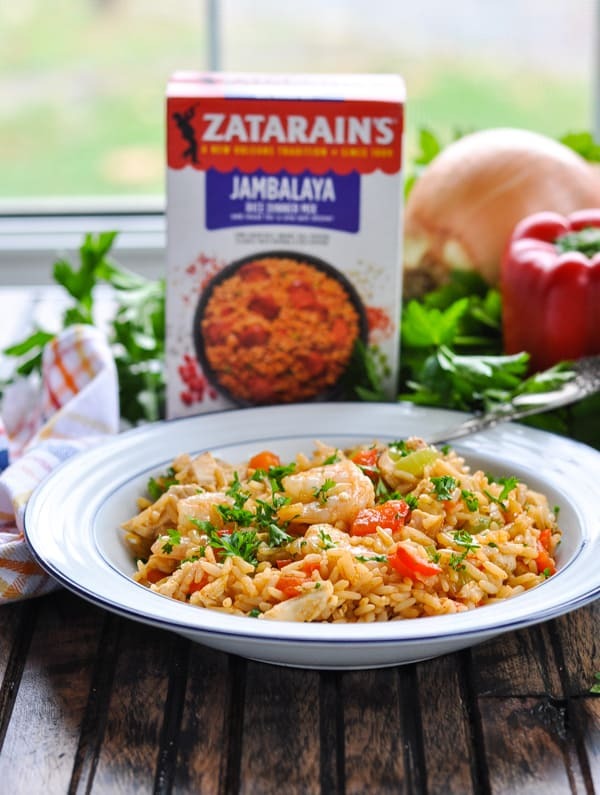 Stir in some Zatarain’s Creole Seasoning or top with Zatarain’s Cajun Hot Sauce for even more flavor! 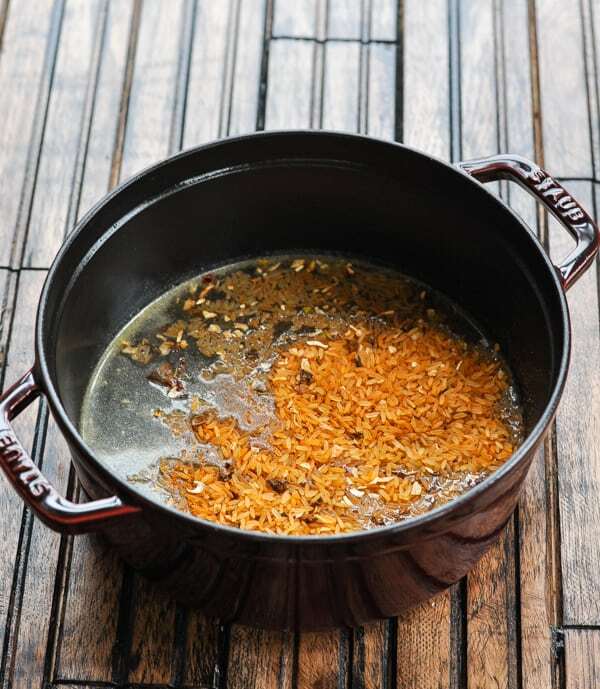 In a large saucepan or Dutch oven, heat 1 tablespoon of olive oil over medium-high heat until shimmering. 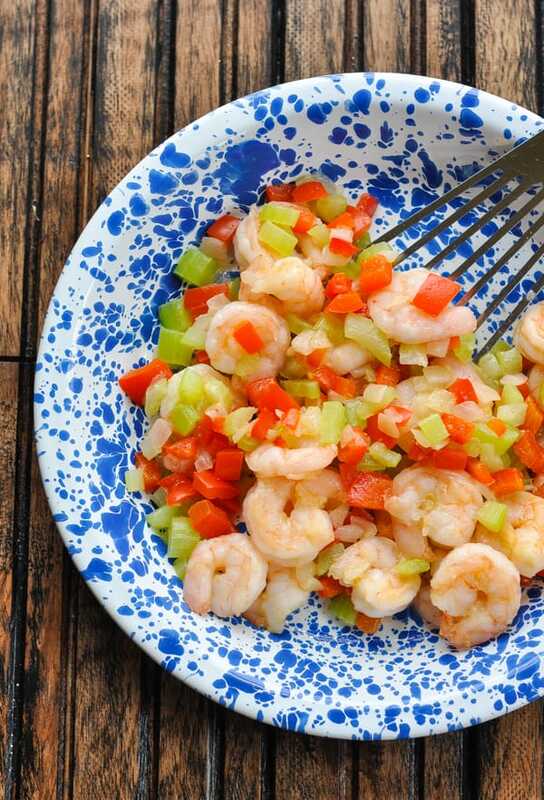 Add diced bell pepper, celery, onion and shrimp; sauté just until shrimp are pink (about 5 minutes). Use a slotted spoon to remove shrimp and vegetables from the pot; set aside. Add water and Jambalaya Mix to the pot. Bring to a boil. Reduce heat to low. Cover. Simmer (covered) for 25 minutes, or until rice is tender. Add turkey, shrimp and vegetables during the final 5 minutes of cooking time. Remove from heat. Let stand (covered) for 5 minutes. Fluff with fork before serving. Garnish with parsley, if desired. This dish is best enjoyed immediately after it's prepared. I don't recommend freezing jambalaya with shrimp, since the rice may be slightly mushy and the texture of the shrimp will be poor. Remove the shrimp and vegetables from the pot as soon as the shrimp starts to turn pink. The shrimp will be added back to the pot for the final 5 minutes of cooking time, so you want to make sure that you don't overcook the shellfish and end up with a rubbery finished product. If you don't have any leftover holiday turkey, you can substitute with an equal amount of cooked, diced chicken.